Available from Balkan Models , price TBA. No pricing or purchase information on the company web-site, so e-mail Balkan Models for more information. Well produced decals with an appeal to a rather limited niche market. Pricing, purchases procedures and stockists need to be obtained via an inquiry to the company. Recommended to those wishing to model Yugoslav MiG-21s. Perhaps the most ubiquitous of Cold War warriors the MiG-21 was, despite some significant limitations, an outstanding design. It went through a considerable development process that completely changed its capabilities, and had a dramatic muscling-up effect on its appearance. After the Cold War western avionics and other systems were marketed to extend its capabilities. Widely exported and built under license, it is one of the most produced jet warplanes, and probably the most prolific supersonic aircraft ever. It introduced numerous air forces to the supersonic club at a bargain-basement price. It was in production from 1959 to 1985, quite possibly another record for jet fighters. Yugoslavia was unique amongst European communist nations in that it pursued a foreign policy independent of the USSR and remained outside of the Warsaw Pact. As such it was courted by the West and through the 1950’s its air force was equipped with American types such as the T-33 Shooting Star, F-84G Thunderjet and both F-86E and F-86D Sabres. However, whilst continuing to remain outside of the Warsaw Pact the Yugoslav Air Force began to re-equip from 1962 with the MiG-21. For modelers this means that both early and late model MiG-21’s can be built in Yugoslav markings. Until receiving these review samples I was unaware of Balkan Models. From their domain name “.si” it seems that they are a Slovenian company. Looking at their website their niche would seem to be the Yugoslavian Air Force. The decals produced so far cover from post-WW2 to at least the 1970’s and 80’s. Theirs is a relatively small decal range, but it seems that a kit is to be released soon of the Bludek XV (Lojze), a Yugoslav biplane from the 1930s. Supplied in A5 plastic zip-lock bag in each case is a set of A4 sized instructions folded in half. 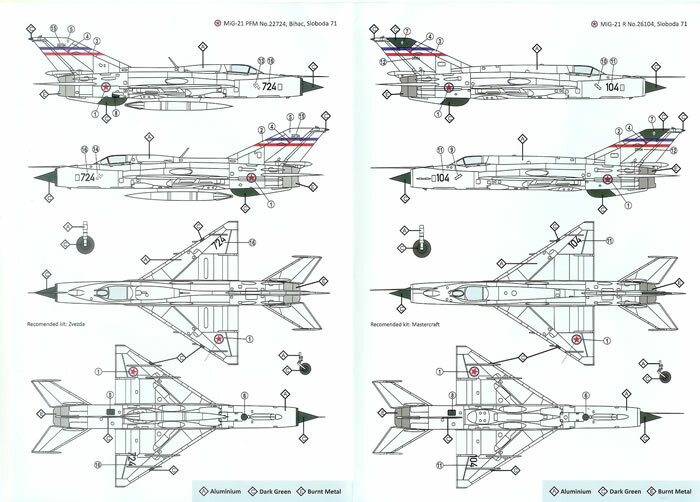 These provide a painting a decaling guide for natural metal MiG-21s. 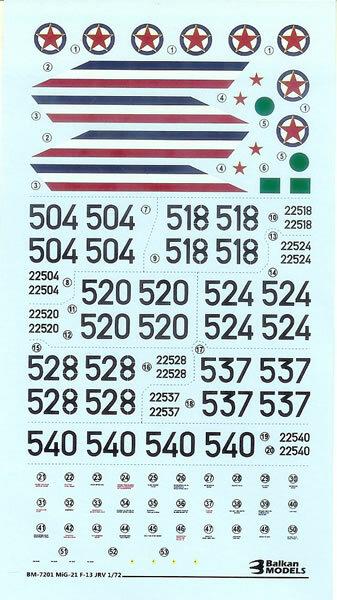 The decal placement guides are clearly drawn and easy to follow. They also include a short aircraft history, a bibliography and application guide. 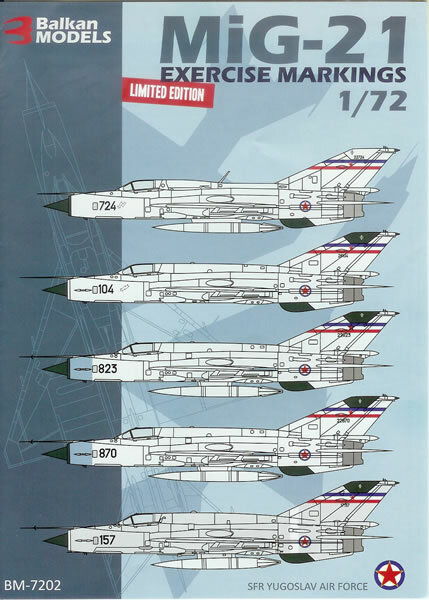 The “Early Versions” set covers MG-21F-13s. All feature the same scheme, and the choice revolves around individual aircraft production serial and service numbers for seven aircraft. National insignia sufficient for two aircraft, and stencils for one are provided. 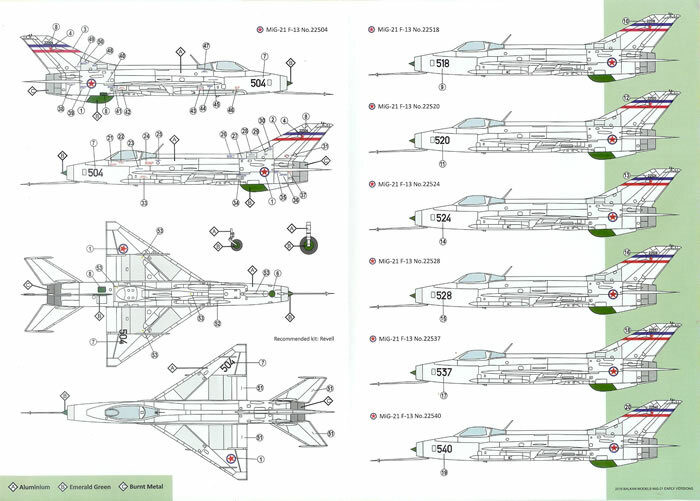 The “Exercise Markings” set is for MiG-21 PFMs. This set relates to aircraft used in Yugoslavia’s largest post-war maneuvers call “Sloboda ‘71”. Again all feature essentially the same scheme, but there are some choices related to special exercise markings. Five aircraft are catered for, and again national insignia sufficient for two aircraft, and stencils for one are provided. 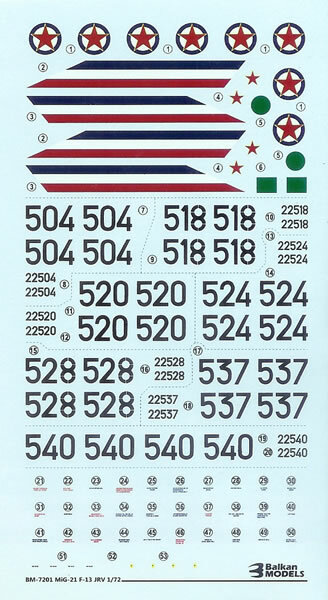 The decal sheets themselves appear to be well produced, with good registration and colour density. One problem I found however that there is no pricing or purchasing information on BM’s website. Presumably an email to info@balkanmodels.si will resolve this. I could not readily find current stockists. The colour schemes reviewed here are not particularly dramatic or unusual, so their appeal will clearly lie with the limited niche market of Yugoslav Air Force enthusiasts they are intended for. These two sheets are nicely produced and look to be good quality. 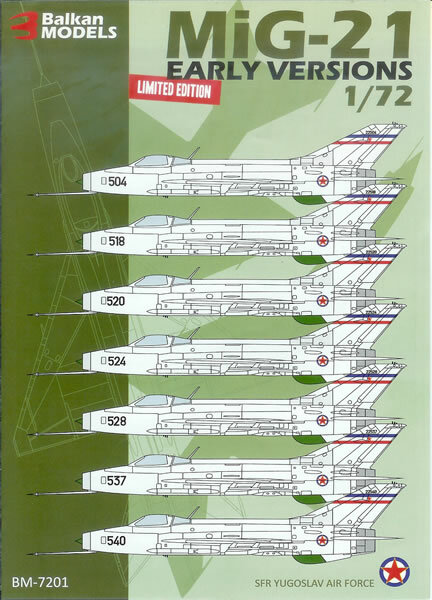 Recommended to those who wish to build Yugoslav MiG-21s. I think Balkan Models would be well advised to list prices on their web-site, along with some sort of purchase mechanism. As an aside, I suspect that a more international appeal would lie with Yugoslav markings for the Western types operated in the 1950s, as it is a bit unusual to see these subjects wearing communist stars, and could appeal to modelers who are not necessarily just focused in the Yugoslav Air Force. Maybe these subjects will be the subject of future releases. Thanks to Balkan Models for the review samples.